12th April-09 Bettadasanapura-Ride - GGI-Group size: 4000+ Professionals, Increasing on day to day basis, Come & join us 2 serve Mother Nature. We wanted to do a long ride from past few weeks, thats how we decided and choosed Bettadasanpaura near Electrinic City (17 Kms Ride). 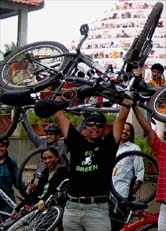 In general this was not a part of Go Green Campaign ride hence not listed in our "this week section" we were 7 members to start off on 12th Sunday morning @ 7:00am from Pranal Enclave. on the way Sidharth Patil need to turn back as he got a call from his residence. 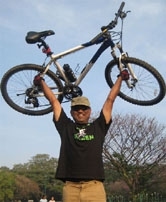 Once we touched Kamannahalli, Rajaram’s bike went flat and didn’t had any puncher kit. We were almost 3 Km away from our destination hence decided to go doubles on my bike. 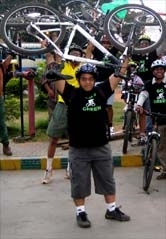 Rajaram & Mahesha switched their cycles and Mahesha got on to my cycle and managed to hold cycle in one hand and bicycle seat in other hand.. all together it was a good experience meanwhile Rajaram called his brother and requested him to come with his car. We dismantled his front wheel and off loaded in Suzik Swift Car. Then started back.